As much as Google's new initiatives continue to flounder, see my posts about the recent NYT and BusinessWeek articles on this subject, their core business continues to roll over the competition. 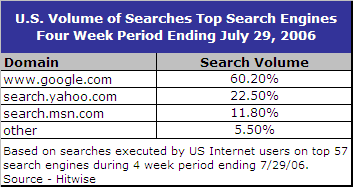 HitWise has just released a report that shows Google has increased their market share to 60% over Yahoo and MSN. Back in October of 2005, in a post titled "Why isn't anyone calling out the press' misplaced Google worship?" I questioned the why the press did not seem to call out Google's numerous misteps. In particular, I pointed out numerous flaws in the Google RSS reader that made is completely unusable. It appears the tide has begun to change and a backlash against Google's numerous inept product offerings has begun. The first mainstream article that really focused on Google's failure to deliver on anything beyond their core search/advertising service was a July 10th article in BusinessWeek called "So Much Fanfare, So Few Hits." "An analysis of some two dozen new ventures launched over the past four years shows that Google has yet to establish a single market leader outside its core search business, where it continues to chew up Microsoft and Yahoo."